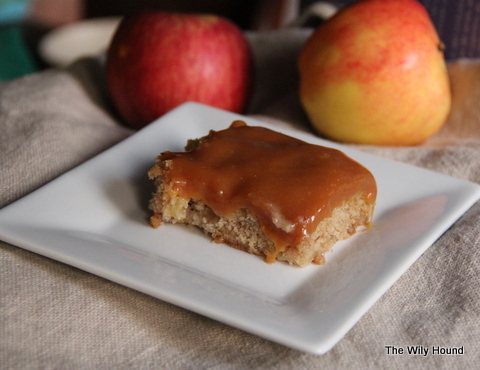 It’s hard to say whether my rabid obsession with all things apple, caramel, and pumpkin is pregnancy-related or whether I’m just getting into the spirit of the season, but I just can’t get enough of Fall treats. 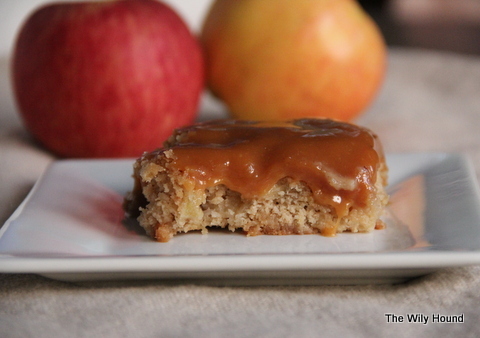 In the meantime, I decided to take the caramel and apple combo in a direction with which I was a little bit more comfortable: baking. 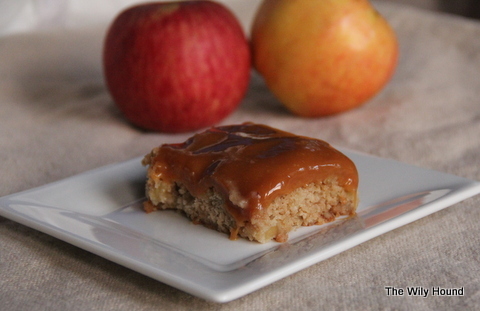 I googled “apple bar recipes” and came across this one here; it had a ton of good reviews and didn’t call for the 13 sticks of butter that a lot of other recipes do, so I gave it a shot (with a few tweaks). 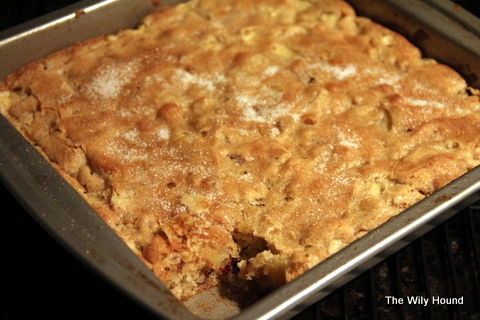 It’s a great recipe and it yields a delicious, flavorful, moist apple cake that will knock your socks off. There are a few changes that you can make depending on your tastes – use a different kind of nut (or omit them all together), skip the cinnamon and sugar topping since the cake itself is pretty sweet (or double it if you’ve got a serious sweet tooth! ), use Granny Smith apples for a stronger apple taste, or use pumpkin pie spice instead of cinnamon if that’s all that you’ve got in the pantry. I used pecans because that’s what I had on hand, I subbed pumpkin pie spice for cinnamon, and I sprinkled about a tablespoon of sugar on top of the batter before baking since that’s all I had at home. The cake came out great and it would have been perfect if I had just stopped there. But as I mentioned before, caramel has been calling my name for weeks now, so I knew that I would have to add some into the mix. I melted some caramels down in a double boiler with some evaporated milk and, after the cake had cooled, I poured the caramel over top and refrigerated it for the night. Now here’s where I have to throw out a “do as I say, not as I do” tip: don’t pour the caramel over the cake and refrigerate it for the night. The caramel will harden and you won’t easily be able to cut the cake the next day. 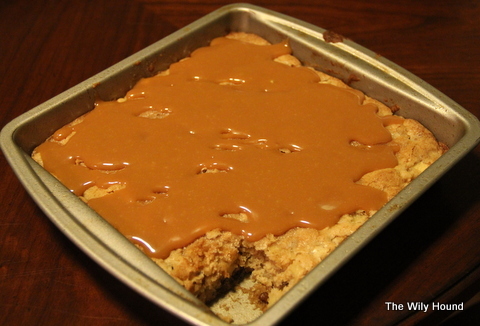 I would recommend cutting the cake into squares and then drizzling the caramel over the individual pieces. For optimal results, I would suggest serving the cake soon thereafter. It’s still delicious if you follow the steps that I took, and it’s cuttable if you use a knife that has been dipped in hot water, but it’s just a messy process and the result isn’t very “pretty.” So if you’re, say, having the the Royal Baby and his parents over for dinner and you’re looking to impress them with a swanky dessert, try the cut-and-drizzle technique instead. If you’re 8.5 months pregnant and you and your husband are planning on eating it of the pan with a fork, then follow my lead. Preheat your oven to 350 degrees and grease a 9×9 inch pan. Sift together the flour, baking powder, salt, and cinnamon and set aside. In a large bowl, mix together the butter, brown sugar, and white sugar until combined. Stir in the egg and vanilla. Blend in the flour mixture until just combined and then stir in the apples and pecans. Spread the mixture evenly into the prepared pan and bake for 25-30 minutes or until lightly golden on top. Prepare the caramel topping while the cake is baking: in a double boiler, melt the caramels with the evaporated milk, stirring frequently, until completely smooth. Place a wire rack on top of a piece of parchment paper. Cut the cake and place the pieces on the wire rack and drizzle the caramel over top. Serve while the caramel is still warm.